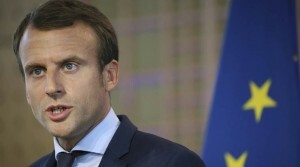 PARIS: One of President Emmanuel Macron’s top security officers was at the centre of an escalating scandal for the French leader on Thursday after being filmed assaulting a protester during a May Day demonstration. Le Monde newspaper published a video showing Alexandre Benalla striking and then stamping on a young man while wearing a police helmet and visor during the protest in central Paris. Imitating a policeman can lead to a prison term of up to a year and a fine of 15,000 euros.